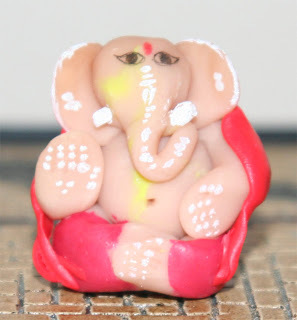 Need some Motivationa and Ideas to make ur own handmade Ganesha ? then keep on reading !! 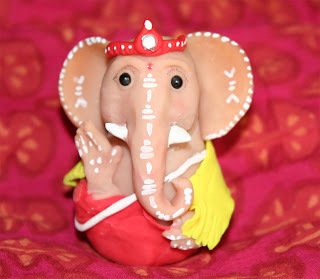 I am really excited today as I am going to introduce to you all one of new co-blogger friend Bhanu Ramesh who lives in St.Louis Missouri, USA with whom I got in touch with her recently.I was searching on the internet on how to make handmade eco-friendly ganesha idol for "Ganesh Chaturti festival" and I came across her wonderful called http://www.bloomingdesignstudio.com/ And I was very much impressed with her creativity and innovative way of making handmade ganesha's every year. She even sells them on her etsy website and Bhanu also takes classes on how to make ganesha idols on your own.Isnt it wonderful ....to know such a talented person !! Look at these beautifully decorated polymer clay ganesha's so cute and made with so much love. Bhanu says "Lord Ganesh is the god of wisdom and prosperity and is always invoked before the beginning of any auspicious occasion"which I am sure everyone of us would agree. 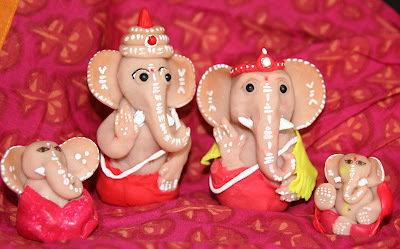 You can also visit her online store at bhanuramesh.etsy.com to purchase one of these idols. I am really thankful to my dear friend Bhanu for quickly responding to my emails when I contacted her inspite of her busy schedule.And also I appreciate her for agreeing to be guest of the month on my blog. Wish U all a very Happy Ganesh Chaturthi festival. Thanks GB and Rekha...I agree Bhanu is really talented. I love this! Work of devotion and art. So much creativity and enterprise on show. She took a class, learned to make these idols, made them beautifully and then had the enterprise to put up her creations for sale online. She has a full-time career going on the side and a family to take care of. We all can learn from her. It's a lovely blog! I have just been to The Karma Collection you wrote about and loved it! These figurines are beyond cute! You have such a talented friend! It's Gorgeous post and also image. I liked it. Perfect accessories for my condo in Chicago Lake front Homes .